There are several thousand types of molds- all of which are fungi that can grow on nearly all organic surfaces. Some are seemingly harmless, while others produce toxic substances. 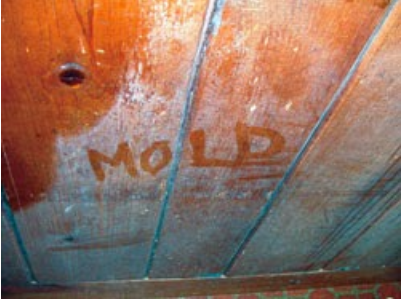 4 things are required for mold to flourish: moisture, high temperatures, a substrate and no UV light. However, Mold spores can be found in dry unexpected conditions as well. Mold that is black is NOT necessarily “black mold”. The only way to know for sure is to have a sample tested by professionals. A musty smell is a good indicator of mold that is not visible. Common places you can find hidden mold is in air ducts, under carpet pads and on the backside of drywall. Knowing what environments encourage mold growth is key in preventing it from taking over your property where you can. Also, knowing what to do when mold does show up will save your home and even your health. Properly ventilate your home and necessary appliances, especially ones that are at high risk for potential mold growth. Areas like bathrooms, kitchens and basements should have windows or fans, and be paid special attention. Ensure appliances like stoves have exhaust fans, and dishwashers and dryers are vented as well. Reduce the possibility of mold on walls by applying paint with mold inhibitors in it. Grade around the property and redirect downspouts away from the home and its foundation to avoid water accumulation. Always clean and maintain the gutters, so water flows freely through the system. Don’t forget to use dehumidifiers and air conditioners if your property has high levels of humidity. Buy humidity meters at your local hardware store if you think humidity levels reach over 50% throughout the day. Realize that no standards have been established for what amount of mold is tolerable or acceptable, according to the CDC and EPA. And due to the ubiquitous nature of mold, many insurance companies do not cover mold remediation or removal. Because of this, it is important to be able to safely remove mold where possible, and know when an expert should be called in. According to the EPA, anything more than 10 square feet of mold should be handled by professionals- smaller areas can be handled at home, so long as proper protection is used as well. Use gloves, protective eyewear and an approved mask when removing mold yourself. Ventilate the room(s) well and use a properly-mixed cleaning solution. Soap and water, or bleach and water are effective cleaning mixtures for removing mold from hard surfaces. Absorbent materials that become afflicted by mold should be thrown away and replaced.